Eugene and I have made another discovery - Casareccio in Hout Bay, Cape Town. It baffles me that it has taken us so long to discover what hordes of people have known about for ages! A place that serves English breakfasts, divine Italian pizza and pasta, Portuguese specialities, perfect pastry and more. A Cucina Italiana with a real Italian Mama in command of the kitchen, a restaurateur whose experience, energy and enthusiasm is daunting and delicious food that invites one to return again and again. Friends introduced us to Casareccio. All eight of us trooped in on a busy week night. Actually, I think that every night is busy at Casareccio. But the friends had booked and we were immediately taken under the warmly hospitable wing of Jorge Ferreira, the owner and his excellent team of service staff. Eugene and I were quite bowled over by the vast array of pizza and pasta choices. There are also a number of salads and 'Speciality Dishes', which reflect Jorge's Portuguese heritage and are star turns at Casareccio. To further complicate matters, there are specials displayed on a blackboard. Good grief, where to start? I wanted everything. We were gently guided through the maze of delights by our valiantly patient companions and finally decided to begin the proceedings with Garlic and Herb Focaccia (or two). To follow, I ordered a half portion of 'Pasta Contadina (Village Style)' with olive oil, garlic, artichokes with white wine and parsley with added chorizo for good measure. And a side salad! Eugene who has a dairy product intolerance, ordered a basic pizza without cheese, but loaded with toppings of artichokes, anchovies, avo and olives. The friends chose a host of different pastas and pizzas and I would taste every one of them. Our drinks orders were taken and we settled back to enjoy the evening. The wine list is very well chosen and incredibly reasonably priced. More about that later. Casareccio is famous for its crisp, thin pizza crusts and the garlic and herb focaccia was just the best I have ever tasted. I could have made a meal of it. My pasta was delicious, a lovely blend of flavours and textures all glistening and unctuous. Thank heavens I had ordered a half portion. The full portions are huge and would test a rugby front row forward's capacity. Eugene's pizza was scrumptious, although I wasn't given much to taste. He, very reluctantly, parted with a mere soupçon. I savoured the tastes of the various pasta dishes that had been ordered at our table, a Frutti de Mare absolutely laden with seafood, also a special smoked salmon and cream pasta concoction. Oh yes, we would be returning to Casareccio and the sooner the better! Our next visit to Casareccio was for lunch. It would be just the two of us and I hoped that I would have an opportunity to chat to our host. Casareccio beckons from under a long blue awning with a sign pronouncing its name in letters large enough to be seen from a distance. A warm welcome from someone at the door, usually the patron himself, 'hello I am Jorge" and we were ushered in. First a sort of ante room, a sweet smile from a pretty lady behind a counter and then through to the body of the restaurant. Red is a predominant colour in the restaurant. The waiters wear red tee shirts and the tables, dressed in gleaming white linen, have red over-cloths. Several walls are painted a lovely warm red which is reflected in a large mirrored wall that faces as you walk in. It is all bright, shiny and sparkling. The waiting staff is well-trained, knowledgeable and friendly. Menus and drinks followed in quick succession and after the usual dithering, we ordered our lunch. I chose a special from the floating blackboard (it follows you around) 'grilled calamari and chorizo'. Oh dear, I had intended to just eat a salad, a rather delectable chicken salad, but succumbed to temptation and compromised with a side salad. Eugene made his usual pizza demands; no cheese, toppings of anchovies and artichokes etc etc on a tomato base. The food arrived and we tucked in. My calamari and chorizo was served with a lemon, butter and garlic and parsley sauce on the side. 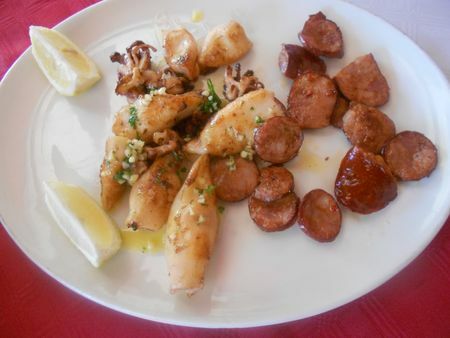 The calamari was beautifully prepared, succulent and tender and the chorizo, spicy, lightly grilled and super tasty. The sauce was a delicious accompaniment and enhanced the already mouth-watering flavours. The salad was crisp and delicious and rounded things off most happily. Eugene tucked into his pizza, crunching away and enjoying every morsel. Lovely washed down with an ice cold Peroni! Jorge came to chat and introduced us to his lovely wife, partner and co-worker, Bernie. Jorge's family hail from Madeira and arrived in Johannesburg when he was 7 years old. His love of food began in the best possible way, in the kitchen of his mother and grandmother. There, captivated by the aromas and flavours of the food, he learnt to cook and bake. He spent hours in the kitchen as his grandmother and mother prepared food for the many guests that always shared their table. He attributes a great deal of his experience and knowledge of restaurants and restaurant kitchens to the years he spent working for Epic Oil. His brief was to check on restaurants and restaurant kitchens and make certain that all was fresh, clean and efficient. He carried this credo into his own group of Italian and Portuguese restaurants that he opened in Johannesburg. It was here that an Italian lady, known to everybody as Mama Lucia, brought her formidable cooking skills to bear. The kitchen was her kingdom and she ruled with ferocious energy. 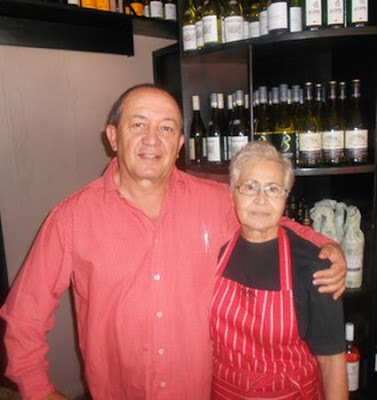 Then onto Cape Town where Jorge and Bernie set about restoring an ailing restaurant, Casareccio in HoutBay. They lured Mama Lucia out of retirement and together they revitalised and restored the business and today Casareccio is buzzing. 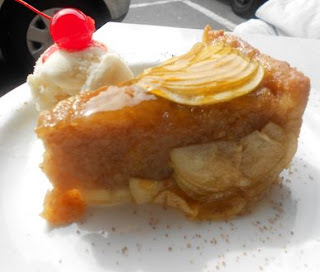 Casareccio means homemade or home-brewed and everything is homemade at Casareccio. Naturally the pizza dough is homemade as is the ravioli and lasagne pasta. The other pastas are made by an Italian associate. Kitchen space does not allow for curtains of pasta hanging everywhere. The cakes and pastries are a sight to behold! Jorge brought out a lemon meringue tart to show us an example of his pastry chef's talent. 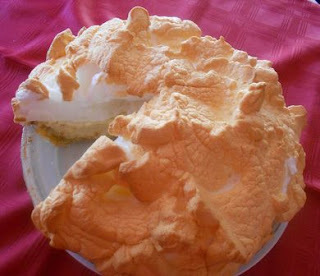 A lovely big, fluffy confection, it was a thing of beauty. It created quite a stir amongst fellow diners. Jorge is at work from 6.30 every morning until late, 7 days a week, and 362 days a year. He closes only on Christmas Day, Boxing Day and New Year’s Day. He opens the doors at 7.30 every morning for the Casareccio Breakfast. Again a host of choices. Try the 'Full English' which is the whole caboodle, whilst the 'Piccola Colazione' or mini breakfast caters for those with a smaller capacity. There is a 'Frittata', that wonderful open Italian omelette, or tuck into the 'Millionaire's Breakfast' with smoked salmon, rocket and poached egg. Enjoy a Health Breakfast, Croissants, Toasted Sandwiches and a whole lot more. And naturally, excellent coffee. The wine list has an interesting provenance. Jorge, himself a teetotaller, asked a group of faithful customers to do a tasting and to choose a selection for the restaurant. Well, they did this and the result, in my humble opinion, is a collection of superb wines in every category. And an excellent house wine! There is pride in serving a good house wine. In France, any restaurateur worth his salt knows that the house wine defines the establishment and that other chefs and restaurateurs will judge him by his offering. I was absolutely astounded by the fairness of the pricing of all the wines. Wine prices in some restaurants have gone through the roof. Not at Casareccio. The list is updated every 3 months, so the fundis are kept on their toes. 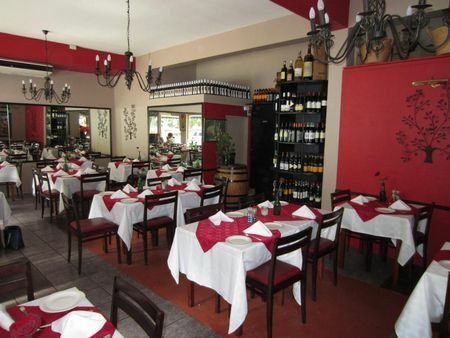 The Portuguese specialities are much sought after at Casareccio. There is a 'Peri Peri Chicken' which is certainly not for the faint-hearted. 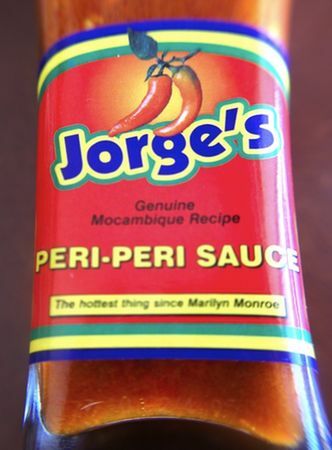 Jorge produces his own peri peri sauce and it is powerful! The free-range whole baby chicken is marinated in the sauce for 2-3 days. Imagine the fire of that! I am told that that is a typical Mozambican style preparation. Then there is a 'Trinchado', a dish that comprises cubes of fillet cooked in a secret spicy sauce; also an 'Espatada', a skewer of fillet prepared the Madeiran way, and a 'Portuguese Steak', a pan fried fillet topped with a fried egg and served with chips or potato wedges. All pretty mouthwatering. There is another facet to this establishment. One can sit outside on the pavement and enjoy the passing parade. One sunny day, my daughter Lexie and I were perched on high stools enjoying a libation, when a lady walked by with a wonderful pot-bellied pig in a harness. The pig, Bella, a regular boulevardier, was very famous until she grew too fat for her harness, Now she lives her life in splendid piggy manner in her owner's garden. And there is another reason to sit outside. One can bring along an adored pet that will be welcomed and immediately served with a bowl of water. 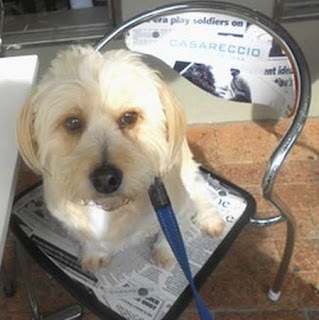 I have a particularly sophisticated doggy friend, Rory, who has frequented many restaurants and is quite the café society devotee. On occasion, while his human family enjoy coffee and a slice of delicious homemade apple tart, Rory sits happily on one of the more comfortable chairs surveying the scene while accepting, with utmost grace, all the fuss and attention that is heaped on him. Yup, Casareccio is quite a happening. Casareccio is open 7 days a week. It is only closed on Christmas Day, Boxing Day and New Year’s Day. The hours are 7.30am to 10.30pm. The kitchen closes at 10pm. Booking is essential for dinner. Address: Bay Beach Centre, Main Road, Hout Bay. Back Chat Eats Out are the dining experiences that Eugene and I have enjoyed and wish to share with you. Almost had me grabbing my car keys and driving over the mountain! Sounds like a MUST VISIT kinda place. 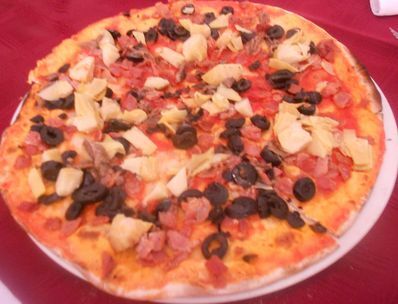 Casareccio produces pizzas much enjoyed by certain well-known chefs. I hope that you will enjoy them too. I'm hungry Leslie!! Thanks so much for a delicious read. Thank you for your lovely comment. I am delighted that the piece has whetted your appetite. Indeed this is one of Cape Towns best kept secrets and lovingly indulged in by a large volume of us Hout Bay residents. Awesome food, great hosting and excellent service. Hard to beat! The secret is out! Now more of us beyond the borders of the Rep. of Hout Bay will be beating a path to Casareccio's door. I'm sure that Jorge and his team will cope beautifully.